You can add, edit or delete DNS records for a domain name registered at another company by adding it to DNS hosting in your account. This will allow you to manage your DNS with us, while your domain remains registered with the other company. From the top menu, click the DNS tab and select Add DNS Hosting. In the Domain Name field, enter the name of the domain you want to manage with DNS Hosting and click Next. A message will appear with a set of nameservers to be added to your domain name. Required: To complete this process and activate your zone file, you will need to update the nameservers on your domain name. This is done at your current domain registrar (where your domain name is registered). 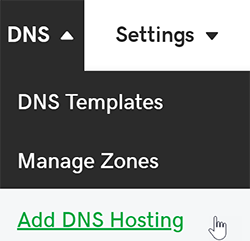 Once the nameservers at your current registrar are updated, you can access your zone file to manage DNS by clicking Manage DNS to view the DNS Management page. Note: After updating your nameservers and/or editing your DNS zone file, allow up to 48 hours for gloabl networks to access DNS information for your domain name. You can come back to view and edit DNS for your domain name at any time. Transfer your domain name to keep everything in one account.